Thom Fountain, originally uploaded by johnwmacdonald. See the little guy on the rooftop? Yeah, the one behind the camera tripod. That's freelance photographer Thom Fountain. In January 2007 he created a blog commemorating the 150th anniversary of the naming of Ottawa as the capital city of Canada by Queen Victoria. Appropriately named "Ottawa at 150", it contains many, many day-in-the-life photos of Ottawa over the course of one year. 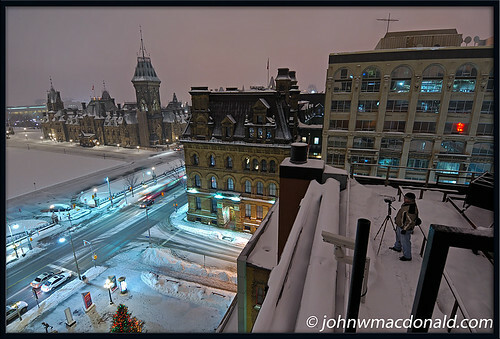 One final duty of the long year of his photographic documentation was to photograph the Christmas lights for the NCC (National Capital Commission) which lit up certain parts of the city (notably Parliament Hill) from December 6th to January 6th. Tonight, Thom and I were on the rooftop of the Capital InfoCenter (5 January 2008). I, being a little more bold than he, climbed up another set of narrow metal stairs to the adjacent (Birks) building to get a higher vantage point for this photo of Mr. Fountain. At the top left of the photo is the East Block of Parliament Hill. The weather wasn't that cold but the falling snow lowered the contrast of the photos, as we had hoped for clear blue evening skies. Alas -- we had no such luck this evening.